The abduction of over 90 girls in a secondary school in Dapchi, Yobe State, is unfortunate. More embarrassing however, is the bid by the Yobe State Government to try shrug blame off its shoulder to blame another by saying it is the withdrawal of the military from the area that was responsible for the incident. The explanation does not just add up because the more the state government tries to point its fingers elsewhere, the more the rest of the four fingers are asking it to do a little bit of self-examination. By saying the abduction occurred because the military withdrew troops from the area is like playing a broken record which sends out some fuzzy sound but fails to strike a rhythm. For a governor who continues to receive security votes, this is counter intuitive as it portrays him as a political office holder who does not know the demands of the office he occupies or what the votes are meant for. For a state that has been under threats of terrorists for several years and which was only liberated through concerted military actions, it defies logic that at the slightest chance of security breach, the governor would try to impugn on the role the military has played in securing lives and property in Yobe and other states. For the avoidance of doubt, the military in the current administration, has done a lot for which the Yobe State Government should be grateful for. 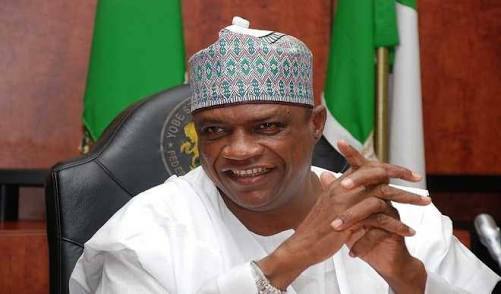 Before the current administration, the insurgents have captured as much as three local governments in Yobe and have made one of them a base from where they from to time enter into the state capital of Damaturu to unleash mayhem; so much so that it became unsafe for even the governor to stay in the state capital. The height of this threat was the takeover of the Government House by the insurgents in one of such attacks until they were flushed out by the combined military operation at the place. The military has several times engaged insurgents in fierce fights in the past in both Damaturu and other towns in Yobe and has succeeded in driving them away to the relief of residents. Through strategies and continuous actions, the military has weakened their base, scattered their lot, destroyed their weapons and captured their commandants. The liberation of territories by troops has made it possible for the state government to conduct its business under a peaceful atmosphere and carry out some projects which wouldn't have been possible if not for the sacrifice of the military. What happened in Dapchi as unfortunate as it was, could be said to be more due to the pampered disposition of the authorities in Yobe and its inability to appreciate the fact a lot lies with them in securing its citizens and that the task of effective security cannot be outsourced wholesale to a federal agency as the immediate communities have relevant roles to play. Much as the military can be called upon to intervene in terms of crisis, the prevention of such incidence lies with the political and civil authorities. It is common knowledge in military operations that when a troop enters and frees a territory, what remains is for the civil authority to mobilize and organize the place to ensure a return to normalcy and forstall a likely breach. These are achieved through actions such as monitoring and constant assessment of the situation using the police and other security agencies, coordination of intelligence gathering and data as well as instituting framework to sustain the peace. But with the benefit of hindsight, it appears the Yobe State Government did none of that but was waiting for the military to mount a 24|7 sentry which is not possible given the number of places that require military presence in the face of security challenges in the country. The Yobe State Government knowing fully well that the dregs of the insurgents still abound, should not have allowed a concentration of school girls at a place without adequately making security arrangements. Aside that, since the issue of the terrorists has become a recurring decimal in that axis, one would have expected that a security buffer should have been stationed for quick mobilization whenever there is an unforeseen attack. But is seems the Yobe State Government only wants to be pampered while it glosses over its own responsibilities. But the time for trading blame has passed, what is required now is for genuine commitment towards rescuing the girls and this is where the full cooperation of the government and the people of Yobe is needed. As this is going on efforts must be made to secure other places using intelligence and civil order because there is no way the military can be in all the communities in Yobe all year round. Ainoko is a public affairs analyst and contributed this piece from Kaduna.